Home page for Ubrace umbrella braces. UBrace® puts a mighty grip on umbrellas preventing them from flying away. More Ubrace - outdoor umbrella braces! The UBrace is designed to anchor a 1 ½ inch umbrella pole to a heavy table. This eliminates the need for a heavy cumbersome umbrella base. The device is simple to use and requires no maintenance. Two collars that are placed on the umbrella pole above the table top and below the centering hole under the table. The U2Brace is a great product for outdoor dining casual tables that have a minimum weight of 40 pounds. The UBrace® is a polished 3 inch diameter x ½ inches wide aluminum two piece split collar with stainless steel bolts. There are two applications where umbrella bases are used. The first is called “freestanding”. This application is required to hold only an umbrella upright. Large and heavy weights are used or the base itself is attached to the surface patio or deck. This use of an umbrella base is usually satisfactory. Matching a freestanding umbrella with a freestanding umbrella base is relatively simple. 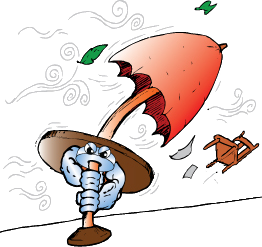 The second application is when the umbrella is used with a table. A Table adds requirements of weight, width, height and diameter. The base must fit under the table, be heavy enough to hold the umbrella from catching the wind and toppling the entire assembly over. An adequate solution is not so simple. There are many size tables designed to accommodate many different size umbrellas and bases. This is the application we will address. Umbrella bases come in a variety of shapes and sizes. When a table is used with an umbrella, the base size, weight, diameter and construction have to be considered. Seems simple, just attach a sufficient amount of weight to the umbrella pole and it should work. Well as simple as it sounds there are almost no products that successfully accomplish this task. Why? well tables usually place requirements on the bases that limit the ability to accomplish the goal. For instance the table may only have enough room underneath to use a base 6 inches high and 14 inches in diameter. This size may not be large enough to have sufficient weight to hold the umbrella. A table may allow sufficient space underneath, however the ratio of the weight of the table and the umbrella may be too much for the components, especially if there is no secondary “centering” umbrella support. Another common problem is poorly made umbrella bases. It almost seems that since they will be put on the floor they loose value and are not considered as an important purchase. Don't let this happen to your umbrellas! UBrace® Brace assembly for an umbrella with a 1 1/2 inch pole used with a heavy table. U2Brace® Umbrella Brace for use with a table and umbrella to prevent flying umbrellas. Ubrace.com - a Furniture Leisure Inc. company since 2003.